With Christmas just around the corner, I’ve been busy working on the first of a few gift drawings. Having just finished my vine charcoal drawing from the previous post, my head was fully in charcoal mode and ready to keep going with another drawing. This particular piece is for an art exchange at my local art league and had to meet certain parameters – an approximate size of 5″ x 7″ which is much smaller than I prefer to work. Due to the size restrictions, I chose to work with charcoal pencils in order to have a finer point while working. Starting with General’s charcoal pencils, I quickly abandoned them after many frustrating attempts to sharpen them. Honestly – if these things cannot be sharpened with a brand new hand-held sharpener without the lead breaking, then I just fail to see the point in making and/or using them, and feel that General’s should address the problem. Thankfully, I had a few Berol charcoal pencils that I bought in college but hardly ever used. These are the kind with the string buried in the shaft that you pull – and then peel off the layers of paper when you need more charcoal exposed. I found that I could get a nice long tip with these that I could then sharpen on my sandpaper sharpening block (my new favorite way to sharpen anything). They’re pretty strong, too. I began with a medium to lay in the darkest darks, then switched to a hard for most of the drawing. The hard gave me a nice range of values and I found the wood textures on the door much easier to render than I expected. 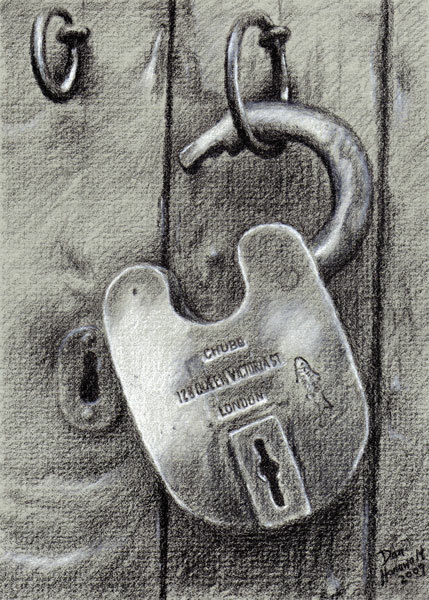 To finish it out, I used a General’s white charcoal pencil (this one worked just fine) and laid in the highlights as well as the light metal tones on the lock. A relatively simple drawing, this only took me about four to five hours from start to finish. I think the texture of the paper is a little too noticeable, but this is to be expected working with charcoal at such a small size. Overall, I’m fairly pleased with it and feel it is a gift that I can be proud to give away – which, in the end, is the most important thing!